Black 4 Mil Flame Retardant 10" x 100"
Black 4 Mil Flame Retardant 20" x 100"
All with free shipping over $100! 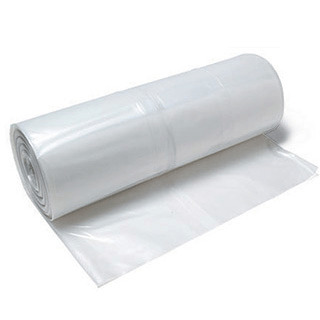 6 mil clear plastic sheeting is one of our most popular products, as it is heavy enough to be used as a vapor barrier to block moisture, or as a dust barrier in abatement situations, but light enough to be affordable and easy to handle. Due to its popularity, we offer a listing for 30 bulk rolls - with free shipping! That price can't be beat. We also offer 10 mil clear plastic sheeting which is used in many of the same applications as 6 mil clear when additional strength is required; it provides superior puncture resistance, impact, and tensile strength for heavy duty applications in which wear and tear is a factor. We sell visqueen plastic in economical standard black rolls in a variety of sizes and mils. Standard black 4 mil visqueen is lightweight while still retaining a bit of strength and body. It can be used in garden solarization, a process in which plastic is placed firmly on the ground and left for several months to attract and retain heat, destroying agressive rhizome plants like Bishop's Weed down to the roots. 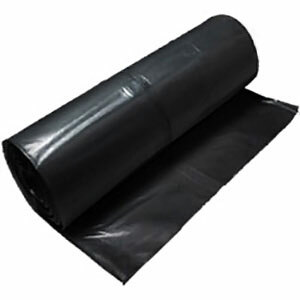 6 mil black plastic sheeting is heavy enough to be effective as a vapor barrier. Generally, vapor barriers must be at least 6 mil, making this plastic an economical solution for moisture prevention. 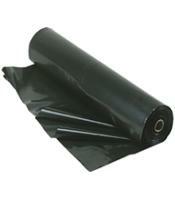 10 mil black plastic sheeting is a heavy duty roll commonly used as a vapor barrier when a thick boundary is required. It is also used for short-term outdoor protection of construction equipment and materials, when an opaque cover is desired to hide the nature of the the protected contents. We offer string reinforced visqueen plastic rolls in a variety of mils and sizes. Reinforced poly is made from high strength film with tear resistant internal scrim. It remains flexible in cold weather climates due to the string body. The extra support of the scrim gives it highly tear resistant strength in applications where rips and punctures are a concern. It is often used to reinforce storm windows because even if the window blows out, the abrasion-resistant poly will hold the gap. It can be used as a scaffolding tarp, a weather barrier, for construction and painting jobs, and much more. It holds up firmly even in harsh winter weather and is often used for long-term temporary enclosures or to protect important equipment that must remain outdoors. We sell flame retardant visqueen plastic in a variety of sizes and mils. Black flame retardant plastic sheeting is primarily used by haunted houses, where fire code requires flame retardant plastic. White flame retardant rolls are often used for hospital or school enclosures where flame resistant visqueen is required. 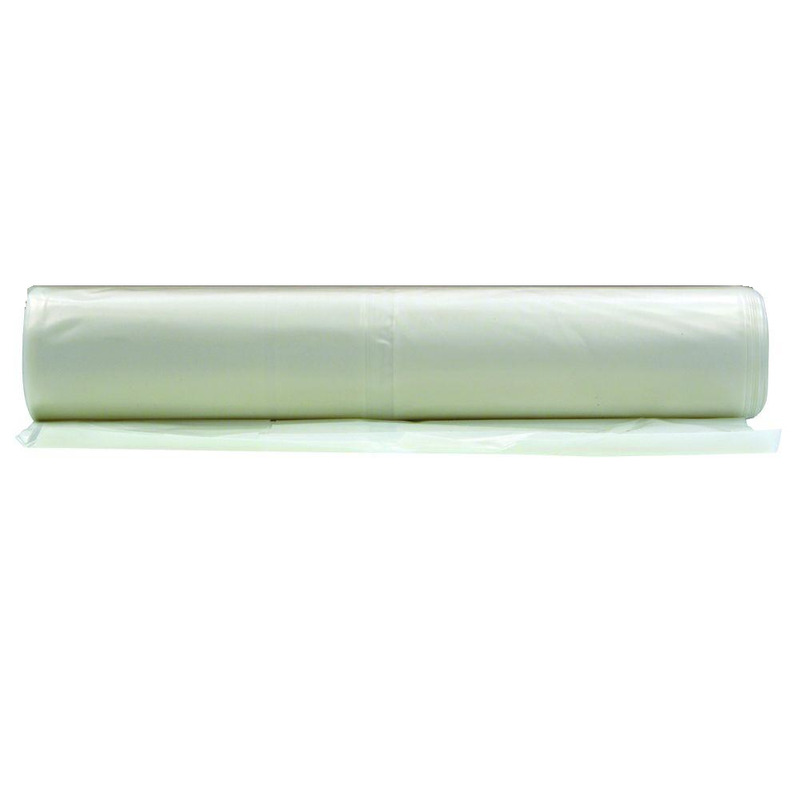 At 6 mil and above, white or black plastic sheeting can be used as a vapor barrier. We sell woven visqueen plastic rolls in a variety of mils and sizes, including black, clear, and flame retardant options. 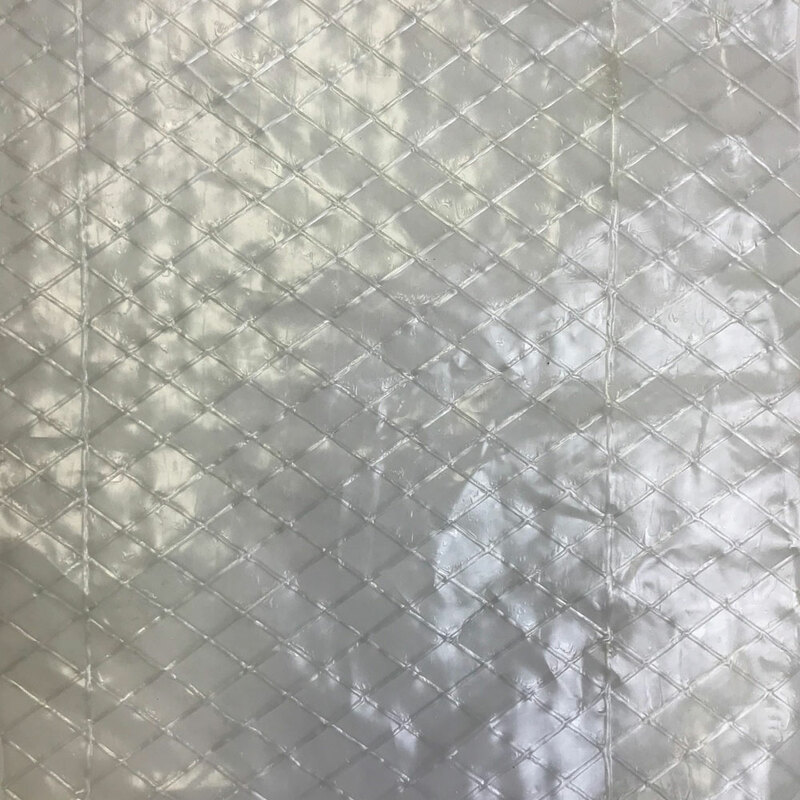 Woven poly sheets are unique in that they allow the wind to pass through while retaining excellent strength due to the woven bond. Woven visqueen is also used for weed barriers because water can pass through it but weeds cannot. It is ideal for use in gardens with existing plants; simply cut the woven visqueen around the existing plants, allowing them through and preventing weeds from passing, while water passes through to the ground. Woven poly's wind resistance and high strength make it an economical option for scaffolding projects (when the extreme tear-resistant strength of string reinforced poly is not needed.) It can also used for greenhouse or hoop house coverings and temporary weather enclosures. When fire hazards are a concern or a compliance issue, you can use our flame retardant woven visqueen plastic. Lastly, it is commonly used to make heavy duty woven sacks that can carry weighty supplies. 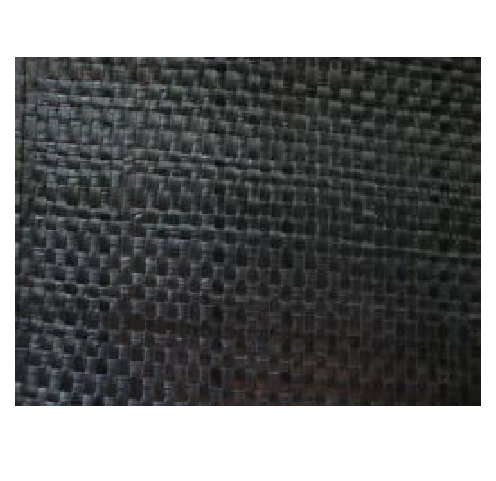 The woven fibers are extremely strong due to many layers. Poly Hanger 1 supports one or more layers of plastic sheeting in front of walls. It slips behind wall molding and is supported by the vertical leg of the molding. Hanger 1 will also support poly in front of masonry or paneling by nailing into a joint which can be easily patched after tear down. Poly Hanger 2 supports plastic sheeting in front of walls by clipping over the horizontal leg of acoustic ceiling wall molding. The prong makes hanging poly faster and ensures it will stay up during the length of the job. 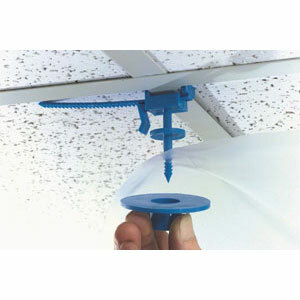 Poly Hanger 3 supports plastic sheeting from ceiling grids and other overhead projects. Poly is installed over the pin and is held in place by a removable retainer. Hanger 3 supports plastic sheeting both horizontally and vertically for building full containments, connecting tunnels, dust curtains etc. Poly Hanger 4 is the same as 3, but includes a 10" cable release tie so it can attach to many different components. More economical than drop cloths for painting! Use inside or outside to cover, protect, separate or moisture-proof. We sell painter's plastic drop cloths from .31 mil to 2 mil in a variety of sizes. Use this when you need the solid coverage of plastic at a low price point. Ideal for protecting furniture and floors from dust and splatters or for use as a tarp. Whatever your price point or coverage, we have the economical thin mil clear visqueen solution for you. Click below to view our wide variety of sizes and mils for this type of visqueen plastic.